It’s a simple black bean soup, but with a citrus tang — from oranges, kumquats or both. I first encountered a similar recipe about 10 years ago, and while I’ve long since forgotten which cookbook it was in, the mix of flavors has etched itself a place in my mind. Most such recipes call for orange juice, but I see no reason not to throw in the whole fruit — the zest goes in during the cooking stage, then I remove the white pith, and blend the flesh into the cooked soup. It’s like juice, but with extra fiber. 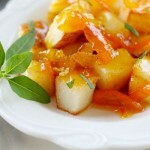 Kumquats also make an excellent addition, as the sweet little balls of zest are in season, too. I added a few sliced up as garnishes to the finished soup, kind of like fruity croutons, but you could substitute them for the oranges entirely, if you want. Just remove the seeds. In case it isn’t clear from the quantities in the recipe, this is a soup, not rocket science. It won’t miss its landing pad if you give or take a few hundred grams of vegetables here or there. This soup easily goes vegan, if you drop the yogurt garnish. Immerse the beans in water at least 12 hours before you intend to use them; there should be at least twice as much water as beans, since they expand quite a bit. Prepare your ingredients: Zest the oranges (remove the orange peel, not the white pith, with a fine grater), chop the vegetables and crush the garlic. Pour a small amount of oil into a large pot or pressure cooker, and put the flame on medium. Add the onions and fry until translucent. Add the garlic and fry briefly until lightly browned. Mix in the carrots and pepper and fry for another minute or two. Drain the beans and add them to the pot, along with the spices, salt and orange zest (if you’re using kumquats, they go in later). Add enough water to cover all the ingredients. Put the lid on the pot; if it’s a pressure cooker, bring it up to pressure. Let simmer for 1.5 hours in a regular pot, or 30 minutes in a pressure cooker. Meanwhile, peel the white pith off the oranges; slice the fruit in half and remove any seeds. If you’re using kumquats, slice them in half and remove any seeds. Turn off the flame and remove the lid; if it’s a pressure cooker, wait for the pressure to subside. Dump the fruit into the pot, in one location, so you can blend it with a stick blender. 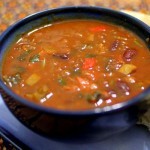 You’ll want to blend about half the soup as well, so that it’s thick and creamy but still has some bean texture. Serve with a scoop of yogurt and/or a few slivers of kumquats. 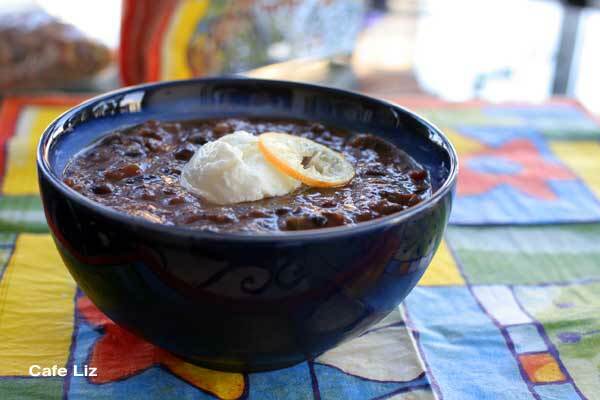 6 Responses to "Black bean soup with citrus"
What an exotic way to prepare beans. 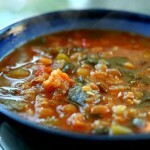 This soup has surely an extraordinary flavour! The yoghurt is ideal to cool down the soup immediately in case of beeing very hungry and don’t want to burn your tongue like I regulary do with delicate soups or lasagna when I am really hungry. Question about the recipe…… What type of pepper? I bought everything to make this – but was not what to use. I have Red Peppers and a fresh Jalapeo pepper. I would think both would be good but thought I would ask. Oops, sorry I didn’t clarify that — I used a red bell pepper. A green bell pepper would also be good. I’m sure Jalapeno would be good as well. Enjoy! Hi Denise, thanks, the loquat reference was a mistake — I meant kumquats. The kumquats would be deseeded and then added right before blending, where the recipe refers to “fruit.” Good luck!